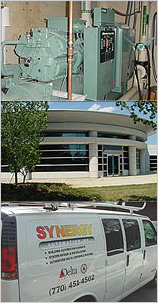 Synergy Automation has the skills and depth of knowledge to design, install, commission and warrant electric, electronic and pneumatic temperature control systems, from stand-alone control systems controlling unitary HVAC equipment with less than a 100 points to large high-speed facility management systems controlling central chilled and hot water systems with multiple air-handling and terminal units with over 30,000 points. 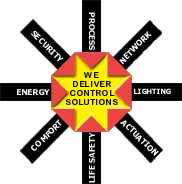 Synergy Automation has performed numerous energy audits leading to implementation of various energy conservation measures (ECMs). The audits identified the feasibility of each ECM based upon the return on investment, from upgrading and retrofitting existing commercial buildings with state-of-the-art energy management and HVAC systems to implementing energy management control strategies and simplified control functions. Synergy Automation provides integration solutions in the use of open protocols such as TCP/IP, Ethernet, LonWorks, ModBus, CAB, BACnet and many more. System integration can include boiler and chiller control systems, HVAC equipment interface, lighting systems, fire alarm, smoke control, laboratory fume hood control, security systems, card access, video, web-based functions and special applications, products and systems. With HVAC, Access and Lighting control products and systems that lead the industry, Synergy Automation delivers the best experience to the customer. Coupled with our business commitment we deliver the world's first fully integrated native BACnet building automated control solution. While many companies claim the delivery of facilities management solutions, Synergy Automation differentiates itself from the competition by providing these solutions in a simplified style. For the building owner, we deliver seamless HVAC, Access, and Lighting products, single source responsibility and service, and a lower install and operational cost. For the building operator, we deliver single seat operation and the need to know one system resulting in ease of management and manpower optimization.